I was using an iPhone 6S. My testing starts in a week. Will this be fixed beforehand? Could you please post the link to the experiment's start page? Thanks. 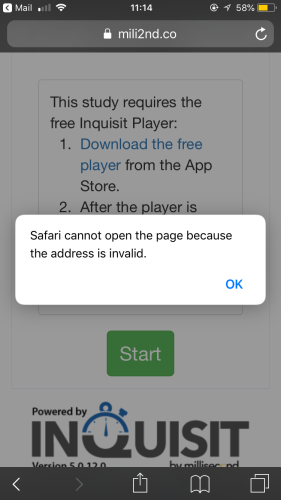 I've tested out our launch page on a few different iOS devices, and the link opens up the Inquisit Player page in the App Store just fine. So, this doesn't appear to be a general problem. 2) There's something specific about your launch page configuration that causes the page link to fail. Check your iOS version and install any updates that are available. If the problem still persists, please send a link to your page. I checked I was using the latest iOS version. - Go to Settings -> Genera -l> Restrictions -> Safari. Make sure it is "allowed" or turned on (swipe to green). Exit out of settings and retry. - Check if "Installing App" in Settings -> General -> Restrictions is allowed. If not, toggle it to on, exit out of settings and retry. - If the above two don't apply, go to Safari settings, and clear cookies and website data. Then restart the iPhone and try again. I've been doing a little research and it seems this can happen if you open the link in Safari and then cancel. Subsequent attempts to open the link will then produce this error message. Apparently, it remembers that you canceled and doesn't give you the option to open it again. The fix is to close Safari (double-tap the Home button, swipe up), then reopen.